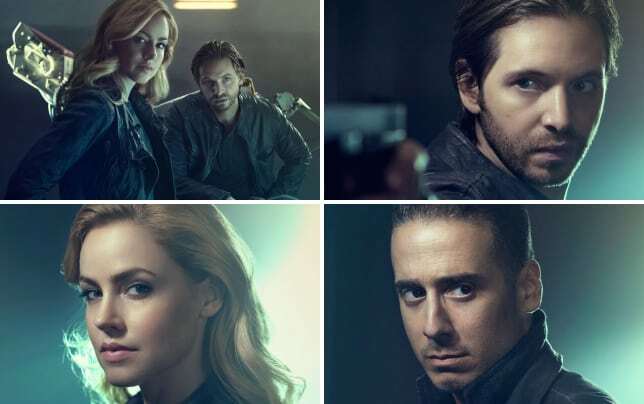 It's no secret 12 Monkeys was one of my favorite new shows of 2015. While it took over a year to return, 12 Monkeys Season 2 Episode 1 wasted no time picking up the story exactly where we left off. Boy are the character dynamics different this season. Cole has learned to value life, while Cassie's become a killing machine. Ramse, Jones, Deacon, Jennifer... the gang's all here and it is glorious! Rather than kick-starting the season with your standard "previously on 12 Monkeys" intro, Madeleine Stowe's narration perfectly set the tone for the hour. "I want to tell you a story about how the world ends" she began. That's right, the original Kathryn Railly will be making an appearance this year in yet another tip of the hat to the film. For those just joining us on this journey, let's quickly recap 12 Monkeys Season 1. James Cole went back in time to stop the Army of the 12 Monkeys from releasing a virus that destroyed mankind. Along the way, he partnered with (and fell for) Dr. Cassandra Railly, a virologist. Back home in 2043, Cole's best friend Ramse learned he had a son who would cease to exist if Cole's mission was successful. Needless to say, Ramse turned on his friend aligning himself with the enemy and guiding their machinations from the past. Ultimately, both Cassie and Ramse were wounded, but rather than choosing either/or our hero saved them both. He sent Cassie to Jones in the future for medical attention and saved his old friend's life in the past... Altering time. With Cole and Ramse stuck in 2016 and Cassie living in 2043, it was clear our leads would not be on the same page this season. Finding their way back to one another is going to be a huge part of their arc. Still, if Cole and Ramse managed it there's always hope for Cole and Cassie. Wasn't it terrific to see that Cole and Ramse's banter was alive and well? After everything they've been through, I still prefer them on the same side rather than at odds. It appears their bromance is stronger than ever, and I'm all for it. The old man jokes keep things light, and I think that's important for a series like this. How about that Budapest chase scene, eh? The bridge sequence was beautifully shot and much more cinematic that anything I can recall from Season 1. Syfy definitely dropped a pretty penny to make this season opener epic. The minute the opening credits and theme kicked in... 12 Monkeys was back! It didn't take long for Cole to figure out Ramse was being tracked. Enter Brendan Coyle (Downton Abbey) as the doc who removed the tracker. Anyone else surprised Coyle didn't make it out of the episode alive? Either way, his brief appearance was great and he got to spill the beans about Jennifer and the start of the plague. Paralyzing Ramse made for quite a tense twist, didn't it? While I wasn't surprised Cole killed Dr. Kalman, I certainly didn't expect Ramse to lie about what he'd learned. I'm glad he shared the truth about the virus sooner rather than later. Meanwhile in 2043, Cassie was recuperating from her bullet wound when The Messengers made their move. Do you think Jones injecting herself means she will be traveling through time as well? Perhaps it was simply a precaution in case The Messengers change something in the past. That way, time will move around Jones as Cassie mentioned and she will be aware of the changes. Wasn't Barbara Sukowa's giggle wonderful after she splintered only part of that Messenger then asked, "so who's next?" You've just got to love Jones, she's so damn ballsy. Unfortunately, the female Messenger splintered successfully and you better believe she's going to cause some trouble in the past. Jones mentioned six went back, right? Our heroes are going to have their work cut out for them. When they announced Todd Stashwick was a series regular, I wondered how exactly Deacon would fit in this season. Once Cassie mentioned Wilson's disease and helping to save his life, I knew he'd take her offer. Deacon is nothing if not a survivor, besides I think he realized quickly The Messengers had a few screws loose. Cassie killing that Messenger was the start of an interesting new partnership. I can't think of anyone better to teach the good doctor how to survive in 2043. I will say, I was expecting more from the Messengers. They disappointed me a bit. After informing Cole that Jennifer had the virus, Ramse and his BFF made their way to New York. Again, I'm thrilled the two guys stuck together. They're just much more fun on the same team. Can you believe Jennifer pulled the virus out on her speed-date? What?!? Emily Hampshire continues to impress as Jennifer Goines, and if someone does not give her an award this season there's going to be hell to pay. She's the Tatiana Maslany (Orphan Black) of this series and 12 Monkeys would not be the same without her. Give Emily all the awards, please! It didn't take Cole long to locate Jennifer, and she seemed pleased someone was there to stop her. Who better than ol' otter eyes? Though I knew Cole would not put a bullet in her head, Cassie was the last person I expected to appear. That's the beauty of a time travel show, a character can pop up at any frakkin' time, right? Cassie is a changed woman, but Cole has changed quite a bit as well. I confess, it took me a while to warm up to Cole last season. This year, I liked him right away. Is Cassie destined to be the unlikable one this time around? I hope not. What a phenomenal start to the new season. If for whatever reason you missed 12 Monkeys Season 1, I highly recommend you binge-watch it via Hulu, Syfy.com or On Demand. There is nothing quite like this series on television, and I really wish more people tuned in live. There's a wild ride headed our way guys, please join me here weekly to discuss the latest installment. Let's theorize together, see if we can figure out what The Witness is after and exactly who he is. Well, those are my initial thoughts. What did you think of "Year of the Monkey"? Does Jennifer release the virus? Will Cassie shoot her forcing Cole to step in? Go ahead, hit the comment section below and share your thoughts with me. You can watch 12 Monkeys online via TV Fanatic if you need to catch up or re-live an episode. NOTE: 12 Monkeys Season 2 Episode 2 is titled "Primary" and airs on April 25.